The Informer trusts this week’s edition of AWIW finds you well, or simply that it finds you at all if you happen to be snowed in somewhere in the UK. Flying in as he did from the sunnier climes of Dubai where he attended the Middle East Telco World Summit this week, the Informer was forced to toss another coal onto the fire to keep the ice off the typewriter. Finns in the cities of Helsinki and Turku however, where a bit of snow doesn’t cause any disruption, could probably feel the heat radiating off TeliaSonera’s new LTE network, which launched this week promising blistering speeds to Samsung-supplied dongles. US mobile operator Verizon Wireless meanwhile has said it will be activating what it claims is the world’s first “large-scale” LTE network this coming Sunday, December 5th, with USB modems from LG at launch and Pantech in the near future. The company said that it expects average data rates in “real-world, loaded network environments” to be 5 to 12Mbps on the downlink and 2 to 5 Mbps on the uplink. But there was snow on the LTE tracks in the UK, where unused capacity in existing HSPA networks is set to satisfy demand for mobile broadband for the next four years, according to research from Informa Telecoms & Media. Due to the density of current HSPA networks, Informa said that it didn’t expect serious mobile traffic congestion to appear until 2013, and even then only in certain hotspots. On to news from the Middle East show now, where one academic courted controversy by championing WiMAX as the enabler of mhealth services. “The telecom community will be fighting for LTE, while the health community is advocating the use of WiMAX,” said Robert Istepanian, professor of mobile information and data communications technologies at Kingston University, London. “There are many applications for which LTE will be useful, but I believe WiMAX will be a more viable infrastructure, especially for the developing world,” he said. Mobile data revenues in the Middle East will amount to more than $10bn per year by 2015, or almost a quarter of the region’s total mobile revenues, according to figures from Informa. As mobile subscriptions in the Middle East cross the 200 million mark, the use of mobile data, including smartphones and mobile broadband services, represented one of the region’s great success stories. All of the operators in the six GCC markets have HSPA networks that allow them to offer mobile broadband services but there is still plenty of room for growth. Only 7.5 per cent of Middle East mobile subscribers are using 3G services at present as a number of major regional markets – including Iraq and Iran – have yet to launch 3G networks. Afghanistan is one of those countries gearing up to begin deployment of next generation mobile technology – either 3G or 4G – as early as next year. The Afghanistan Telecom Regulatory Authority (ATRA) is currently in talks with the country’s four mobile carriers to gather opinion on the allocation of spectrum for next generation services. It is not yet certain whether the regulator will simply allocate spectrum to the operators or whether an auction will take place. However the aim is to have commercial 3G services in Afghanistan by the end of 2011. There is believed to be some discussion as to whether it would be a better move to leapfrog 3G and go straight to 4G. ATRA recently posted a tender for a consultant to provide technical assistance for the valuation of frequencies to be licensed to mobile operators for 3G and WiMAX. The role would include an assessment of the readiness of the Afghanistan telecom marketplace for the introduction of 3G services; and recommendations for appropriate licensing fees for 3G spectrum and for WiMAX spectrum. In September, a consortium including France Telecom signed a memorandum of understanding with a view to acquiring a 40 per cent share of Moroccan operator Medi Telecom (Meditel) for €640m. Earlier this year the French operator also launched as the third player in Tunisian after winning a licence to provide fixed and mobile services with partner Divona and the company is due to bid for Syria’s third mobile operator licence. It is also known that regional player Etisalat was in talks with Korek since 2008, over the acquisition of a stake, yet the Informer has heard the talks finally collapsed earlier this year and Etisalat is no longer interested. Korek originally operated in the autonomous region of Kurdistan and acquired a national mobile licence in 2007. However the firm needs some financial backing to move ahead with its expansion plans, hence the talks over a stake sale. Regional analyst Matt Reed believes the purchase of Kuwaiti logistics firm Agility’s indirect ownership of a 50 per cent stake in Korek may be the easiest route in for an investor. Google meanwhile has its eyes to the skies, with the satellite operator it backs – O3b Networks – set to launch services in 2013 after this week securing its final round of funding. The company has raised a total of $1.2bn from a group of investors and banks, which will allow it to launch the first of its satellites dedicated to providing low-latency, fibre-quality internet connectivity between developing markets and the global internet infrastructure. Counting Google as one of its leading backers, O3b has also attracted the interests of HSBC Principal Investments and Liberty Global, as well as Bridge Venture Partners, Allen & Company, and SES as leading investors. Funding has also come from ING, CA-CIB, Dexia, DBSA, AFDB, DEG, Proparco, FMO, IFC and EAIF, as well as the Development Bank of Southern Africa, Sofina and Satya Capital. Thales Alenia Space is currently constructing O3b’s first eight satellites and is using a system design that will allow O3b to add many more satellites to the constellation in the future in order to increase capacity. O3b’s satellites will be placed in orbit 8,000 kilometres from the earth, four times closer to the planet than regular geostationary satellites, which should give customers extremely low latency. O3b will begin commercial service during the first half of 2013 following the planned launch of the first eight satellites by Arianespace with a Soyuz launcher from French Guiana. Moving to Europe now, where UK-based carrier Vodafone has unveiled a cross border roaming initiative that it says will bring simpler and lower pricing for smartphone and mobile data usage for customers travelling within Europe. Amid regulatory pressure to reduce the retail cost of mobile data usage while abroad, Vodafone said its new, simple and transparent pricing provides daily and monthly rates for customers to use their domestic handset data plans overseas. Those customers who travel occasionally can take a domestic data plan abroad for only €2 per day, which the operator claims represents a cost reduction of up to 60 per cent over existing plans and includes an increase to the data allowance. In the package users receive 50MB data allowance when roaming on all prepaid and postpaid plans across Vodafone’s European countries plus Switzerland, Austria, Belgium and France. Alternatively, frequent travellers can select to take a price plan which includes 25MB per day data roaming within their monthly domestic package of £40 and above, or for an additional £10 if the package is below £30. The new plans are being rolled-out in Vodafone’s major European markets during November and December, in time for the winter holiday season, and across the company’s entire European footprint by summer 2011. And back to the cold countries, where BlackBerry maker RIM has announced the acquisition of Swedish mobile user interface designer, The Astonishing Tribe (TAT), for an undisclosed sum, to help develop the BlackBerry PlayBook and smartphone platforms. 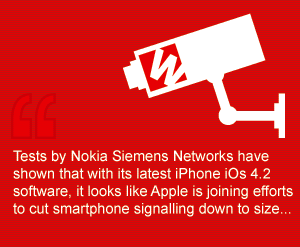 Meanwhile, over in Finland, tests by Nokia Siemens Networks have shown that with its latest iPhone iOs 4.2 software, it looks like Apple is joining efforts to cut smartphone signalling down to size. NSN has confirmed that the latest firmware supports a technology called Network Controlled Fast Dormancy, which makes the network and the handset work together to create the best conditions for smartphones to work quickly, yet have a long battery life and minimize network congestion.